We have a number of projects on the Cedar such as; tree planting, fish surveys, road crossings, and more. Click here to check our Chapter News for more recent projects. The Chapter has been involved in a multi-year project to improve shade and cover along the Cedar River. We have been planting cedar seedlings and needed protection for them to enable them to get established along the banks. Getting cages ready to protect the young plants from deer. Thanks to Gladwin H.S. and the DNR! Friday, July 17th, 2016, Steve Wilkowski and Harley Holsinger made a trip to the Field Trial Area for a review of what our Beaver Dam removals and stream flow improvements looked like and what else needed to be accomplished in the coming weeks of summer. They walked the North Branch of the Cedar River from Three Tubes Stream Crossing to above Trestle Junction, to the 2013 furthest point of upstream dam removal done in 2013. Along the trip one small Beaver dam was removed below Trestle Junction along with two areas of flow/fish passage blockage along the way. 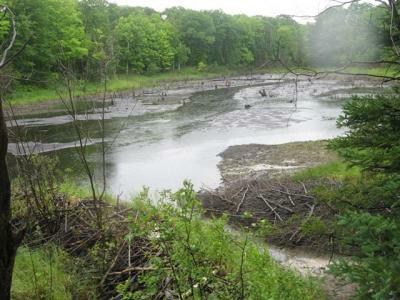 There were several flow problems/partial Beaver dams that will have to be worked on below the opened 2013 Beaver Dam. Steve was surprised at the amount of wooden wing walls that were still functional in that upstream stretch and that may have been up to 20 years old, but still viable. 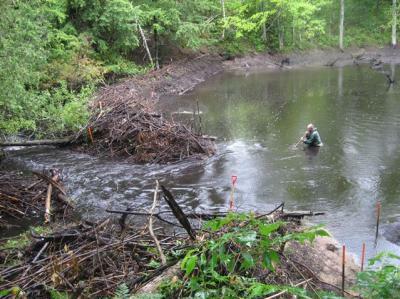 Here are the photographs from our dam removal efforts mid-July. All of these photographs were taken after approximately 3 hours of debris removal. Harley and Tori were working on the area where the beavers have focused their efforts, which is depicted by the cedar crossing over the flowing water. The beavers have a good chance to easily rebuild this dam at the pinch point. 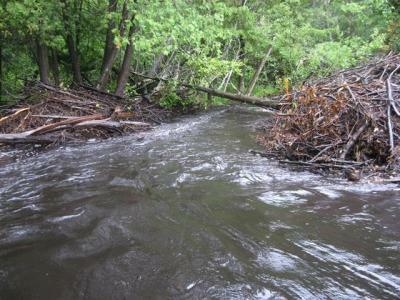 We should saw out that cedar tree that lays across the water to prevent more debris from catching on it because it is definitely being utilized as a major advantage for rebuilding. This should create a positive impact on the Cedar River, the cold water trout stream that our Chapter calls home. This beaver is a smart one. Hopefully Bruce will work his magic and get this beaver trapped. → Trapper gets $ ...Beavers move back in...etc.